Emily Mortimer is a terrific English actress who has shown her incredible emotional vulnerability in such films as Hugo, Lovely and Amazing, Shutter Island, and Lars and the Real Girl. Last year, she reinvented herself as gutsy executive producer MacKenzie McHale in Aaron Sorkin's The Newsroom on HBO. In perhaps her most stunning performance yet, Mortimer portrays Leonie Gilmour, the editor and mother of Isamu Noguchi, who travels the world in search of art and freedom. In the gorgeous new film Leonie, she bravely tells the story of this remarkable woman who nurtured her son's talent, as well as her own. 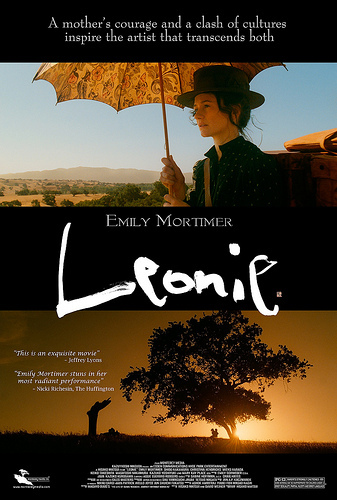 Leonie opens in New York on March 22 at Clearview 1st and 62nd Cinemas. Nicki Richesin: I greatly enjoyed your brilliant portrayal of Leonie Gilmour in Leonie. In a sort of pivotal moment in the film you tell your son, "Your art will be your weapon. Your art will be your voice. There are no boundaries for an artist. No borders. Through art you can speak all languages and lead a magnificent life anywhere." Have you adopted a similar philosophy? EM: Yes I absolutely do. I studied Russian at university and on a gap year in Moscow and learnt then how important art can be, especially for people living under a totalitarian regime - how it can be life and death. I had a boyfriend in Moscow who came to visit me in England for Christmas while I was still at university. It was the first time Dennis had been out of Russia and I took him to a benefit concert in the local village hall near my parents' house in Oxfordshire. Deep Purple (who also lived nearby) where playing. My boyfriend sat next to me and wept. He couldn't believe what was happening. Deep Purple had been a huge underground band in the Soviet Union while he was growing up and he and his friends had all treasured and passed round bootlegged cassettes of their records which had come to symbolize freedom and the West to them. He told me the only reason any young Muscovite knew who Hieronymus Bosch was was because one of his paintings was on the cover of a Deep Purple album! Dennis, who was a poet, also taught me all about Anna Akhmatova and Marina Tsvetaeva (both Russian dissident poetesses living at the same time as Leonie Gilmour), and all the writers who had been interred under the Soviet regime and died in gulags. He told me about a poet called Daniel Xarms who he said had killed himself by swallowing a crucifix in prison. So I learnt from my Russian boyfriend all about the power and danger of an artist's voice. And especially about the power of Deep Purple! NR: Leonie was inspired by The Life of Isamu Noguchi: Journey without Borders by Masayo Duus. Did you read Leonie Gilmour's memoirs and poetry when doing your research? What surprised you the most about the life she led and the observations she made in her work? EM: Yes I read all about her and any of her own writing I could get my hands on. What I loved about her was her humor. She had the dry humor of a lady who had lived through a lot and seen a lot, who was a fighter and a survivor. Leonie Gilmour was a 'New Woman' and I was also fascinated by what it meant to be a liberated as a woman at the turn of the 20th century. 'New Women' were really the first women to be educated at university (Leonie herself went to Bryn Mawr as well as to the Sorbonne in Paris). These women read George Sand, traveled the world and had open, searching minds and hearts. But they didn't see their journey as a struggle in opposition to men as the feminists of the 60's did. So it was a different kind of liberation that they experienced. They were in some ways true free spirits, and this was very interesting to me too - finding a way of being a 'strong woman' but not one with any particular agenda. Leonie's quest was simply to see and experience life and art in a way that was satisfying and exciting to her. NR: In the Hollywood industry, actors often complain about the lack of strong roles for women, but you've gotten to sink your teeth into some gutsy and powerful characters. How does it feel to speak the sassy, rapid-fire lines with Jeff Daniels on The Newsroom? It's like watching Rosalind Russell spar with Cary Grant in His Girl Friday. EM: It's the most wonderful thing. I never thought in a million years that I would get to speak dialogue like that. I grew up as a lonely TV addict - in the rainy English countryside there was nothing much else to do but watch old movies on the telly. I had watched a lot of 1930's screwball comedies movies long before I was old enough to have any clue what they were really about. But I loved the way people spoke to each other in those films. It chimed with me for some reason. I feel very lucky to get to do that at work on The Newsroom. Who else but Sorkin has the ear for that kind of dialogue these days? But it's also constantly frustrating because a lot of what we do is the kind of stuff that ordinarily should take weeks to rehearse - quick fire, crazy speak where the scenes turn on a dime - and we are working on such a tight schedule. So many nights I come home from work and feel like I didn't do it justice. A lot of jobs you are trying to make the most of a bad script. With this one I'm just doing my best not to let the script down. NR: Leonie made incredible sacrifices for her children, but confessed she reclaimed her life in Maine in the end. When she travelled to Japan to reconcile with Isamu Noguchi's father Yone, she suffered the humiliation of being a second class citizen and a second wife. 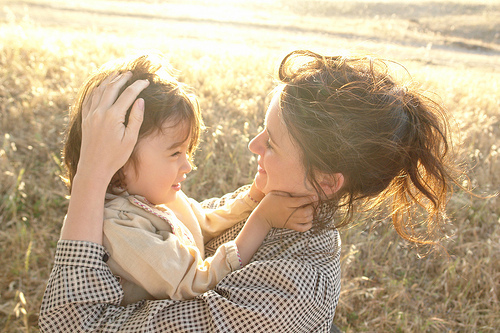 Despite the constant struggle, she decided to return to her life as a single mother. Do you believe her sacrifice was justified by Noguchi's success? Were you an admirer of his work? EM: Well I think she made some of those sacrifices for selfish reasons. Leonie herself was a frustrated artist. She gave her life to editing the poetry of Yone Noguchi (Isamu's father), but she was never really acknowledged for this. She believed in art above all else. And she wanted to vicariously live out her dreams and aspirations through her children. In some ways Isamu Noguchi was himself his mother's greatest work of art. I am a huge admirer of Noguchi's work and have come to it mainly through doing this movie. The Noguchi Museum in Queens (and his old studio) is one of the most beautiful small museums I've ever visited. His sculptures are an amazing marriage of Eastern and Western influences. His conflict as an artist and also his genius is that he never quite felt that he belonged - either in Japan or in America. NR: At the end of Leonie, she wonders, "Why was I so greedy in my youth? I now find beauty in simple existence, abandoning all worldly desires, just like a tree or a stone." Did you feel the same sense of greed in your own youth? EM: I think I'm more greedy now! In my youth I felt like it was embarrassing to try to get things for myself or to do well. But unfortunately now that I'm a little more ambitious and rate myself a little more highly, I'm also old and wrinkled. Youth is wasted on the young! NR: In The Newsroom, your character MacKenzie McHale has returned from two years of reporting in Iraq and Afghanistan and now faces a new battle in ensuring the American public is informed as executive producer of News Night. In our polarized nation with a culture that often confuses politics with media, do you feel a responsibility to present journalists in a certain light? EM: I don't want the show to be telling journalists how to do their job or telling anyone viewing the show how they should think of journalists. Journalists are human beings like anybody else and I'm just interested in trying to convey a complete person who is many things at once. NR: In the last scene of Leonie, Leonie tells Yone "We have our own poem, Yone. Our child carries our wishes to the future. The poem we wrote will last forever." He offers Leonie a kiss "different from all other kisses." What do you think he's really offering her in that moment? EM: I think he is offering her nothing different. I think he is offering her the opportunity to fall under his spell again and she is strong enough in that moment to turn away. That's always the most satisfying moment for a woman. When we have the courage and strength to say 'no' to a guy that has made our lives hell. The difficult thing for Leonie is that Yone was the love of her life and ultimately he rejected her. You never quite get over the ones who reject you! NR: The Newsroom returns to HBO in June for a second season. What can we expect from your character in the second season? There are loads of American pop-cultural references (The Bad News Bears, Rudy) in the writing. Do these resonate with you as an English woman? I read that you loved Moonlighting and that was part of what inspired you to take the role. EM: I have learnt so much about American culture doing the show. But I still get teased mercilessly on the set for being a hopeless Limey. And when I complained that we didn't make one single reference to The Royal Wedding last Season no one had the slightest bit of sympathy. NR: Which projects are you currently working on? Do you have any dream roles you'd love to play or director and actors with whom you'd love to work? EM: My husband (Alessandro Nivola) and I started a production company a year ago called King Bee Productions and the first thing that we've produced is a six part mini-series commissioned by Sky for British television. It's called Doll and Em. I wrote it with my childhood best friend, Dolly Wells. It's a semi-improvised dark comedy about what happens when a Hollywood actress hires her best friend to be her personal assistant. But I'd love to do a movie next. Any kind of movie. I miss movies. I miss the time you get on a movie. I miss the spaces between the dialogue. How something as simple and mechanical as just picking up a glass can become important and poetic. For more details on Leonie, visit http://www.leoniemovie.com.